Today in the gym, a rather handsome, muscular young man strutted into the cardio theater. He stepped onto the elliptical trainer next to me, plugged in his headphones, and turned on his TV. I watched him scroll through the channels, stopping when he saw the movie “Up” which was playing on the Disney Channel. I, coincidentally, was watching it, too. I am guilty of watching emotional movies while riding the elliptical trainer, and I’ve laughed out loud and even cried in the cardio theater more times than I can count. I am a woman, a mother, and a former elementary school teacher. I couldn’t be more in touch with my inner child, and I honestly don’t care who sees me laugh, cry, or gush over a Disney film. The gym, however, is a raging sea of testosterone where men swim silently like predatory sharks, making sure all those around them can feel their presence and power. Men in the gym try to appear very…manly. While there are several man-approved channels on the cable line-up in our gym, this particular young man chose to watch a Disney movie. He is obviously in touch with his inner child, but more importantly, he’s not afraid of what other people might think. I have a feeling he will make a great husband one day, and one heck of a dad. I don’t remember the Pinky Promise from my own childhood, but it was definitely part of my daughter’s youth. 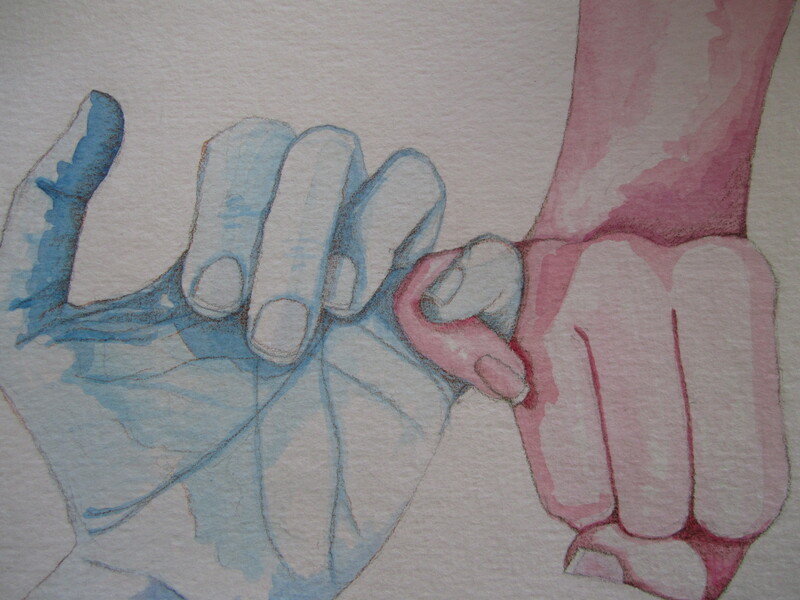 An unspoken contract between friends who are more like sisters, the Pinky Promise create an impenetrable vault for secrets. Four years ago, I told my husband I was having maternal stirrings. I either wanted to have another baby, or adopt another puppy. He made a wild dash for the classified section of the newspaper. It was time to search for a puppy. 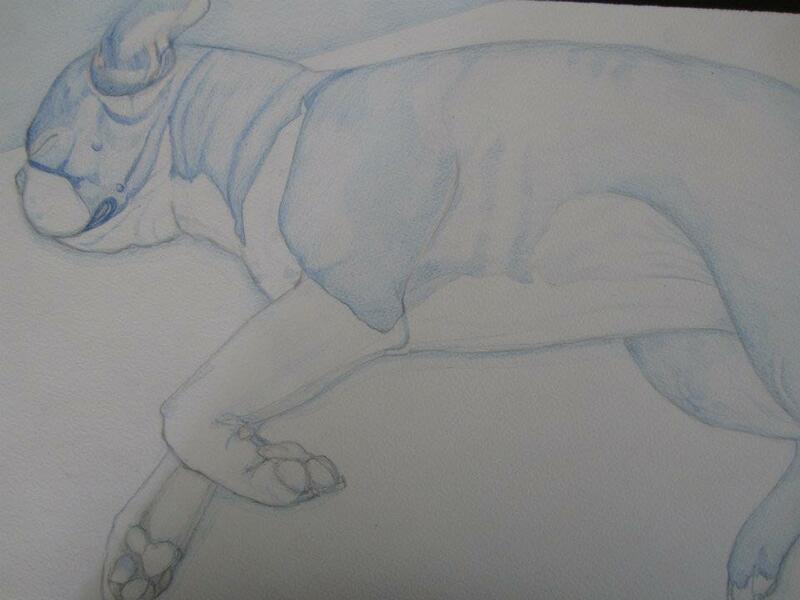 I decided I wanted a female Boston Terrier that I could breed. We already owned two Bostons, and I was prepared to let the third have just one litter of puppies before I spayed her. I was set on finding the perfect female. I talked to breeder after breeder, and looked at countless photos of puppies. The puppy had to come from a reputable breeder, the lineage had to be AKC, and the parents had to be on premises so I could get a sense of their temperaments. 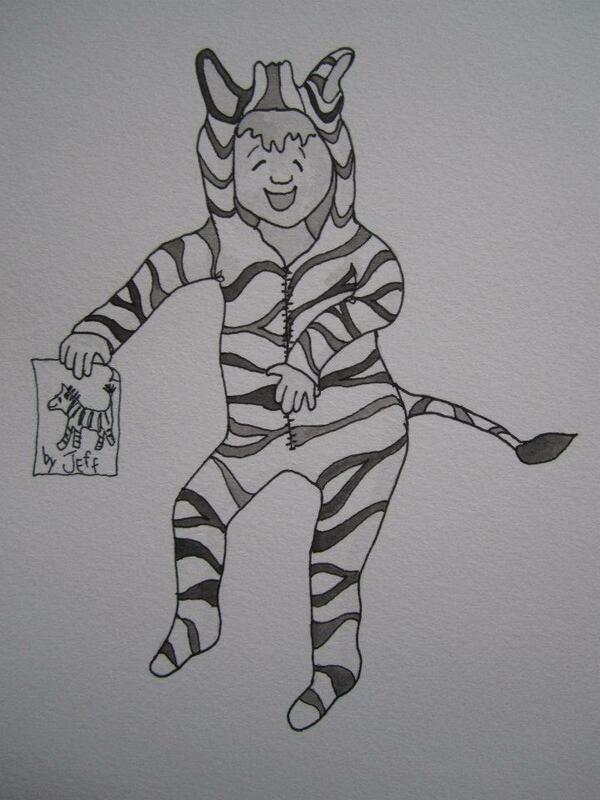 I was looking for a little girl with perfect markings, a well centered blaze, good eyes—the list went on and on. One day, I got an email from a breeder in Geneva. There were photos attached. 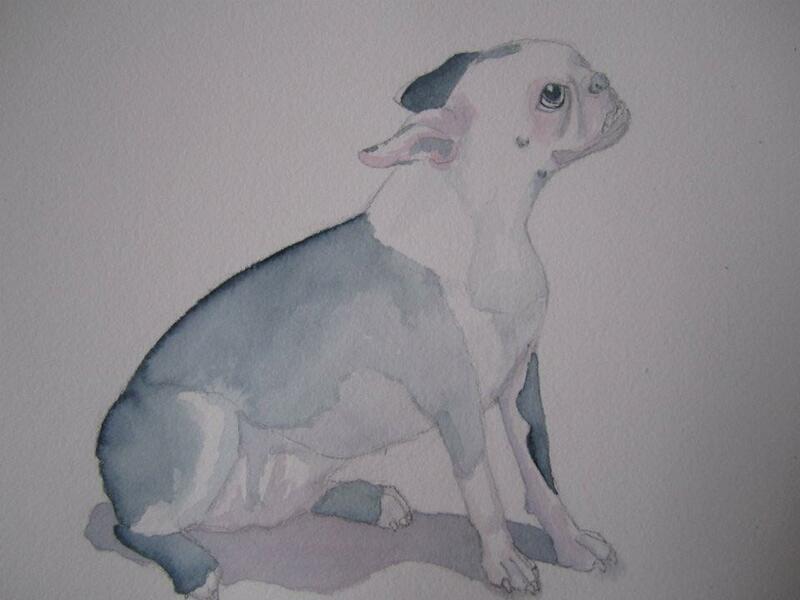 I opened the first one, and there, staring back at me, was a little white-faced Boston Terrier. She had one black ear and a spot on the top of her head, fawn colored eyes, and an impressive under bite. She was far from the perfect puppy I had been searching for, but something about that face made me squeal with delight. We drove out to see her later that day. She was the runt of her litter. The breeder had nicknamed her E.T. because she was all ‘head’. He had feared she would die since she was born so small, but he went to great lengths to save her, including giving her private nursing time with her mother since her siblings crowded her out at every feeding. His little E.T. became our little ‘Sundae’. She was not the puppy I had been looking for, but it was love at first sight. She was far from the breed standard, so I had her spayed. She is a funny little clown, more bulldog than Boston, who brings such love and joy to our family. I guess she was the perfect little girl, after all. Thirteen years ago, we built our house in a new development where an orange grove once thrived. We moved from an established neighborhood carved out of the woods in Ormond Beach, to a quiet street with new sod, sapling oak trees, and no wildlife to speak of other than the gator who lived in the lake behind our house. Slowly, over the past decade, the trees began to mature, and life followed. First, the ebony crows appeared, then the grey mourning doves and mocking birds. The armadillos and possums were followed by an explosion of scampering squirrels—still all shades of grey. 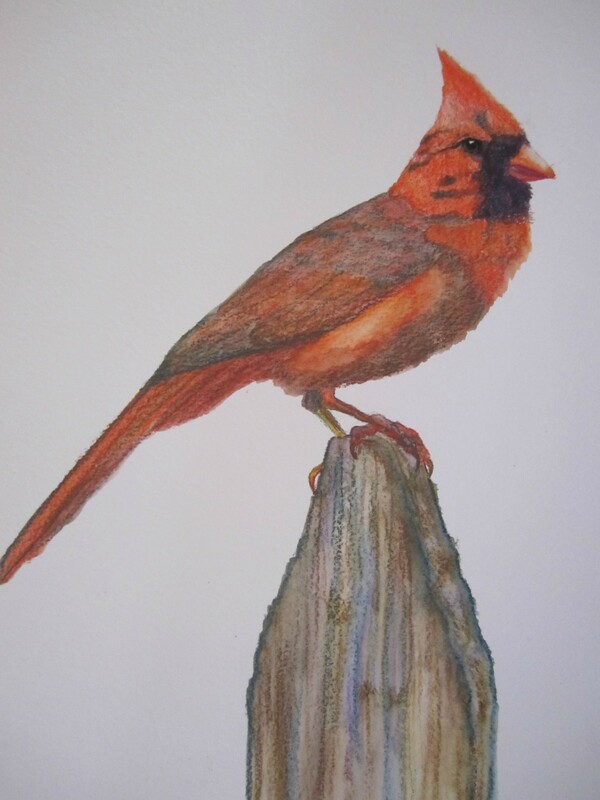 Just this spring, the vibrant red cardinals and the brilliant blue jays arrived. Now our neighborhood has a little color that’s accompanied by wonderfully melodious songs. Orlando is finally starting to feel a little more like home. My Boston Terrier, Champ, provides me with constant companionship, love, and comfort. He is my studio dog, snuggle buddy, and security system. Occasionally, though, the tables are turned. When he’s sick or injured, or when there’s a Florida thunderstorm booming outside, I comfort him. It’s nice to be able to give back. It’s quiet this morning on Tamberrino Island. My husband is at work, my daughter is still in bed, and all three of my Boston Terriers are curled up on the couch. Sundae, my youngest dog, snores like a freight train and yaps in her sleep. Her eyes, nose, and feet twitch as she taunts some imaginary playmate in her dreams. Lucy, our rescue, still sleeps with one eye open. Champ, my senior, sleeps quietly, soundly. Still, I’m sure he dreams. I often wonder if he dreams about his old pack mate, Rainey. And I wonder if he misses her, like I do. My obsession with sea turtles started when I was young. One balmy summer night in the late 1960’s, my parents roused my siblings and me from our slumber. Wiping the sleep from our eyes, we walked quietly down to the beach, the full moon lighting our way. I still remember how cool the damp sand felt under my bare feet. My mother held her finger to her lips as she led us to the dunes. There, bathed in silver moonlight, was a huge sea turtle laying her eggs. We kept our distance and swallowed our gasps, but at the time, it was the most magical thing I had ever witnessed. 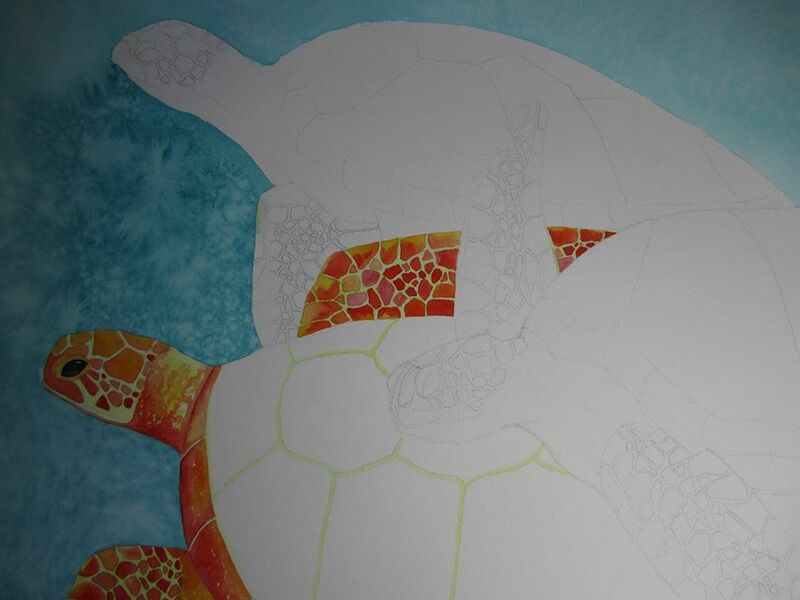 And so began my love of sea turtles. Since then, I have grown to respect the gentle giants and their amazing journeys. 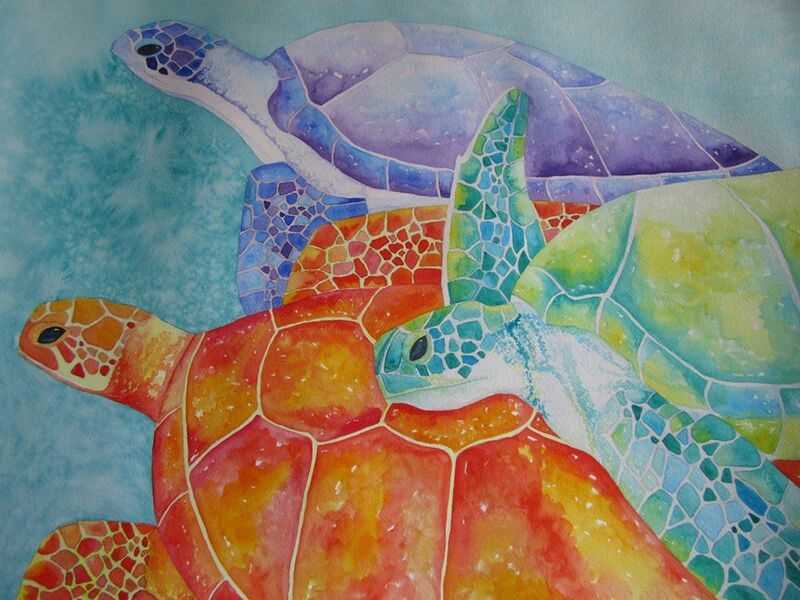 I marvel at the way they lead a double life on land and sea, the way their scutes become individual mosaics detailing their travels, the way their eyes show glimpses of the wisdom they have gained over decades of roaming the Earth’s oceans. I see them as the silent guardians of the sea. I can only imagine what things they have seen, the stories they could tell, the secrets they keep. In honor of completing my first year of blogging here on WordPress, I am engaging in a fifty-two week multi-media project I call “A Show of Hands”. 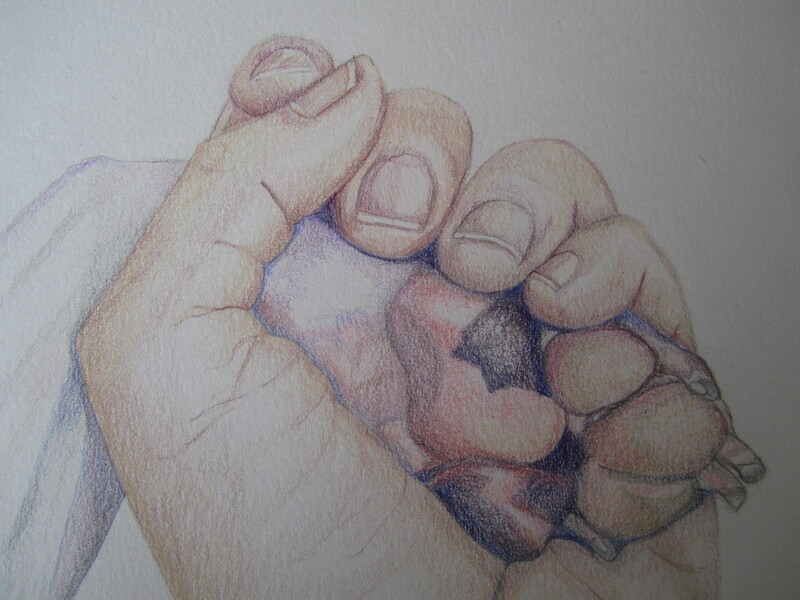 Our hands enable us to communicate, to express ourselves, to create. 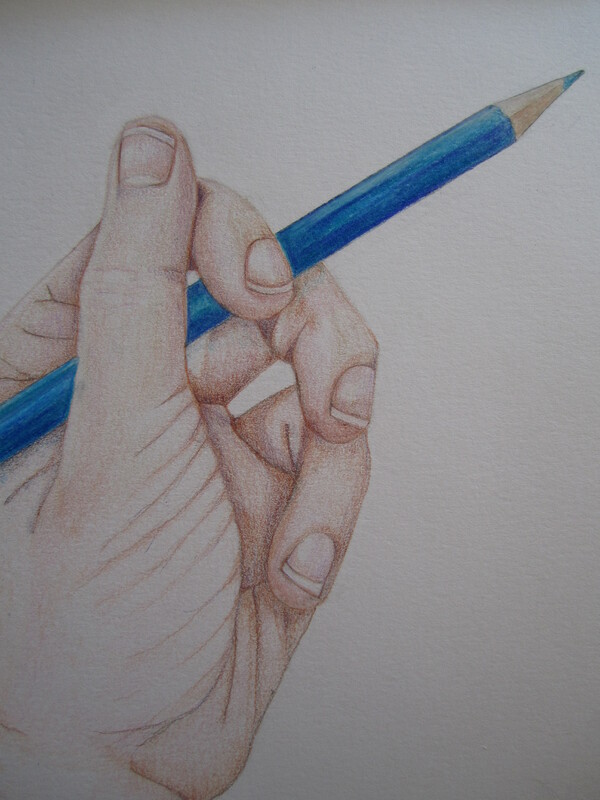 Each week, I will craft and post a drawing or painting that celebrates the incredible, versatile hand and all it can do. 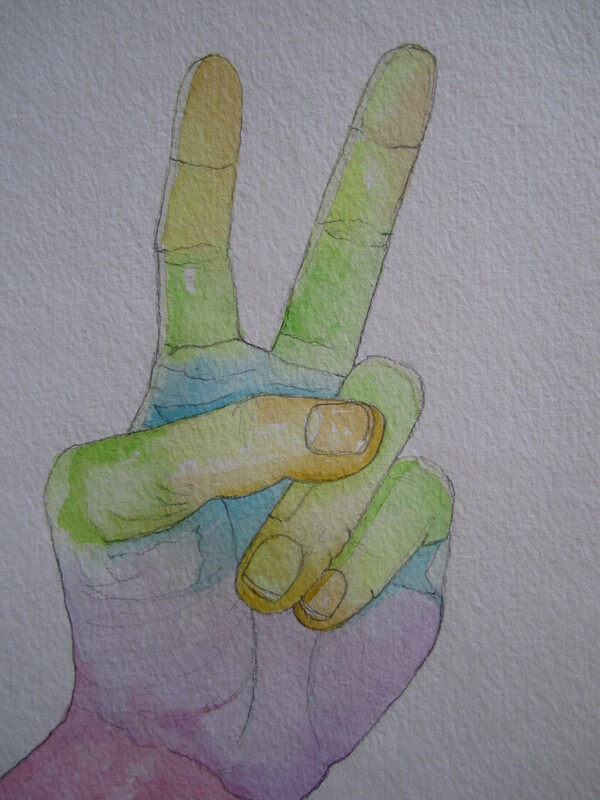 Today, I am sharing one of my favorite hand signs and something this world could use a little more of—Peace. Everyone has heard the classic childhood question “What do you want to be when you grow up?” When I was young, the possibilities appeared to be infinite—and absolutely attainable. At the time, I didn’t give any thought to paying for college, job availability, potential salary or any other pragmatic threats to my dream goals. It was all about imagining myself in those roles, and they all seemed very realistic. As an artist, I have the freedom to create any reality I can envision. I’ve just started working on a new piece, and I’m in the process of planning my color palette. My watercolor tubes are lined up in front of me like delectable confections in a candy shop. Now I just have to decide which colors will satisfy my sweet tooth. It’s easy for me to imagine the possibilities, and the way I see it, they’re endless.